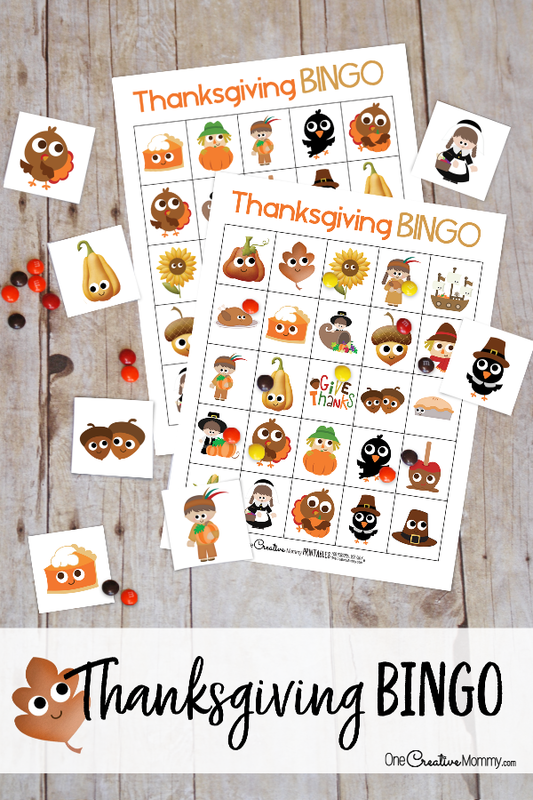 You are here: Home / Blog / Best Thanksgiving Bingo Game! It’s Bingo time again! My Bingo games have been so popular that I thought I’d make them for all the holidays. Other families must like Bingo as much as mine! I already shared Halloween Bingo last year, so now how about some Thanksgiving Bingo? Ready or not, here it comes! How do you keep the kids busy while you’re preparing Thanksgiving dinner? You’d probably never choose bingo because the kids need you to call the game. This game is different! Since the boards come with picture calling cards, even the youngest member of your family (sorry–no babies) can be in charge of the game. All she or he has to do is pick a card and hold it up for the rest of the players to see. It’s easy, and there’s no parent supervision needed. 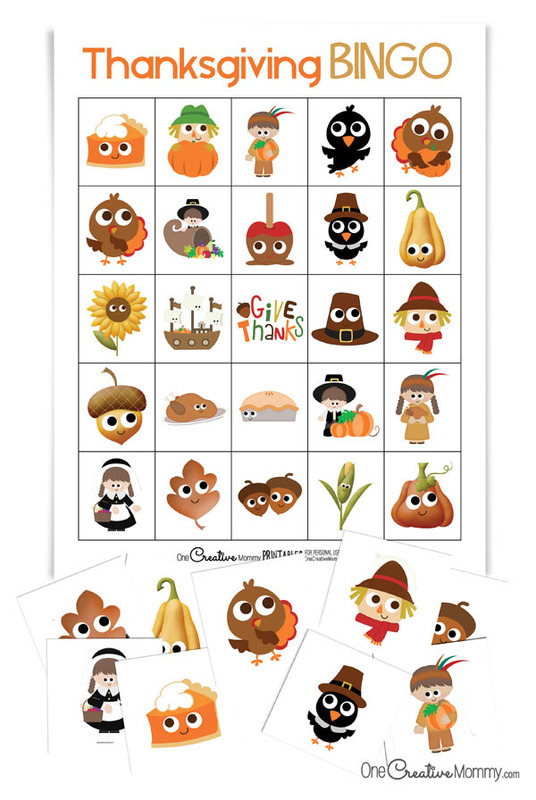 So that you can get the whole family involved, the free printable Thanksgiving bingo game comes with 6 unique bingo boards. Just click on the download image below to open the pdf file in a new window. You can print the file from there or choose to save the file to print later. Expecting a big crowd for the holiday? No problem. Head over to my Etsy store to download the same game with 30 unique bingo boards. 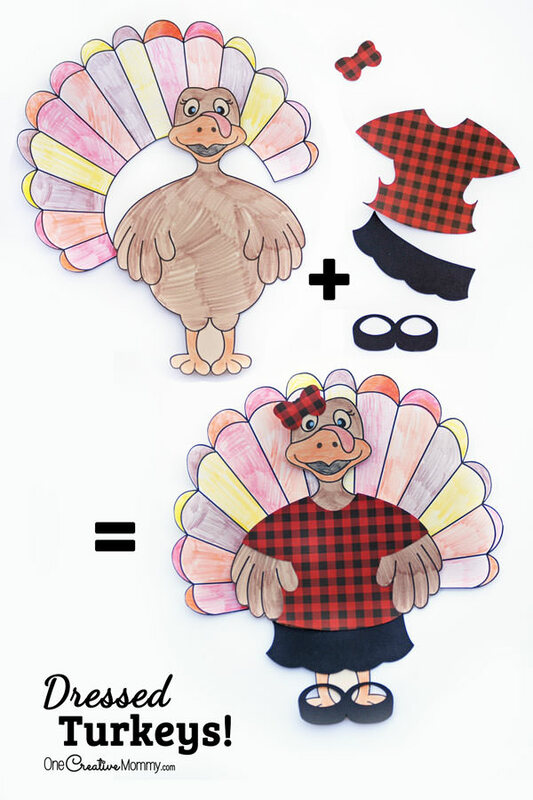 Need some more ideas to entertain the kids while they’re waiting for Thanksgiving dinner to cook? Try these activities. Visit the posts by clicking on the images below. What a great idea Heidi! I love that this is a Thanksgiving activity where everyone can participate! I have pinned it on our Thanksgiving board. Thanks, Daisy. Bingo definitely works well for all ages. No one gets left out! Another one! Just perfect! Your designs are exceptionally cute! As you know, we played Halloween Bingo last weekend. I was surprised at how long the kids wanted to continue. And playing alongside their parents is great family fun! 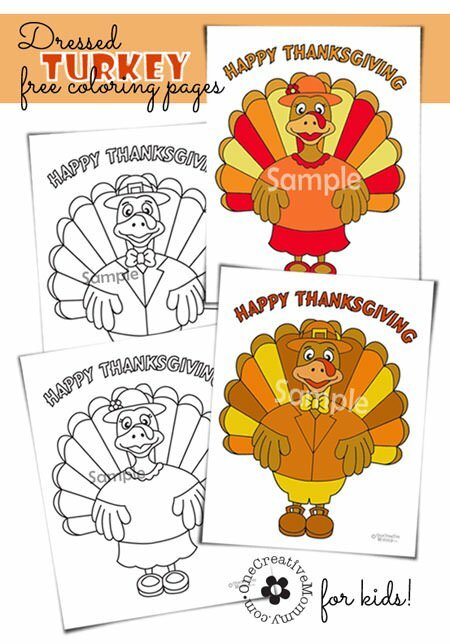 Pinning and printing for this year’s Thanksgiving. Thank you, Heidi! Thanks, Joyce. I really like Bingo because the whole family can play together, and you don’t even have to “dumb down” the game for the little ones. You’re welcome, Jenn. I hope you and your family have a great time together this holiday season. What great ideas! I love the bingo especially. It’s so much nicer when the kids are happily occupied when they are waiting for the Thanksgiving feast to start! Thanks, April. That’s exactly right. Preparing a huge dinner is stressful enough without hearing, “I’m bored,” every five minutes! Thanks, Rosey. 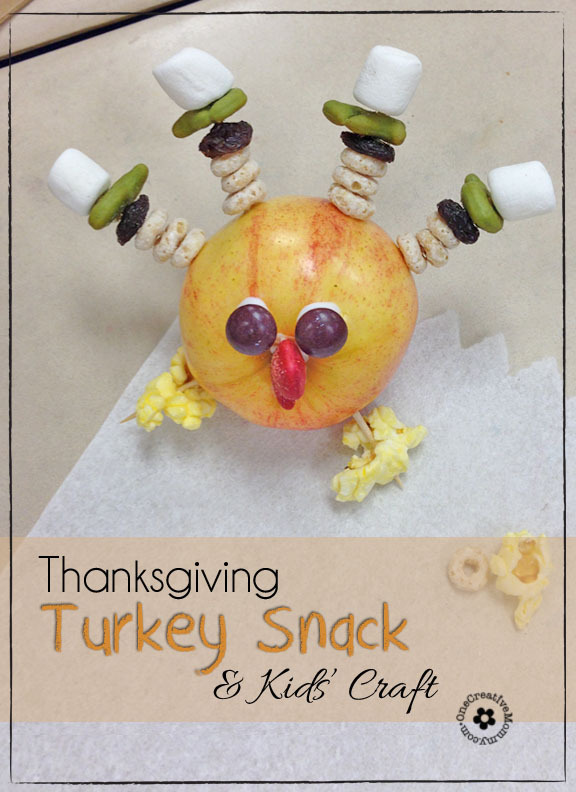 That turkey snack idea came from the Kindergarten teacher where I was long-term substitute teaching. The kids really loved it. I love this post! So many great tings! In my day we were not smart enough to print our own holiday Bingo game, that is brilliant! And I love the turkey like snack! Thahnks, Mitch. When it comes to keeping the kids occupied while you’re trying to prepare Thanksgiving dinner, it pays to get creative! These are adorable and would be so fun! Thanks, Emily. My children enjoy playing with their cousins when the extended family gets together. 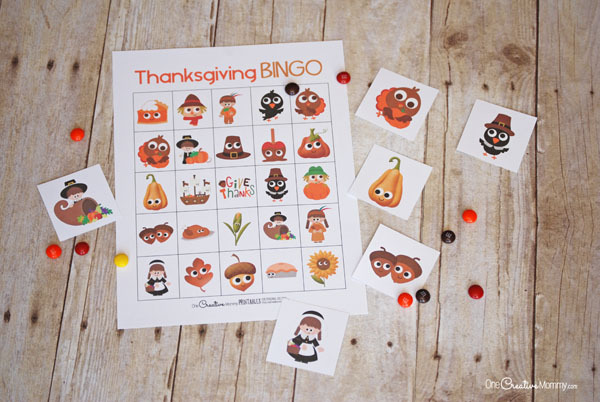 What a great Thanksgiving game idea! This will give the kids something fun to do while the adults are in the kitchen. Thanks, Marcie. That’s the plan. The kids play while the adults work. Hmm. It seems like there’s something wrong with that picture! (I guess that what holidays are about when you’re a grown up! 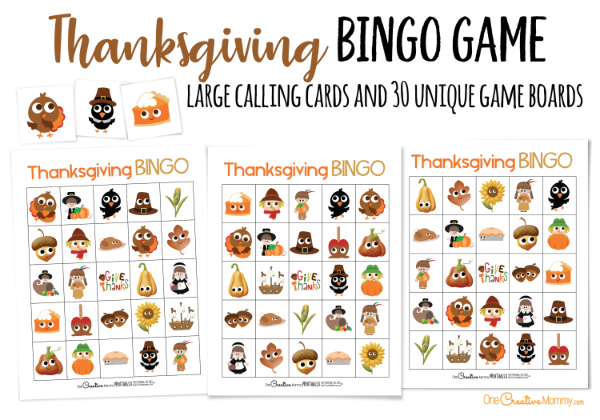 This looks like a fun bingo game for Thanksgiving!! I know my kids would love this on Thanksgiving! Thanks, Audrey. My kids won’t just wait for Thanksgiving. They’ll play it all month long! My kids were just asking to play bingo. I think they’d love the Thanksgiving version! Thanks, Denise. Be sure to check out my other versions, too. So far, I have bingo for Christmas, Halloween, the 4th of July and Thanksgiving. Be looking for Valentine’s Day bingo in January. Pinning for my daughter to use with her Pre-k class! Thanks, Roseann. I hope she enjoys it. Pre-k is such a fun age!